Have to hit ‘go’ after manipulating a slider. ??? This is a problem for many simulations, non? When graphs cleared, a residual .3m/s^2 remains. I’m having trouble reproducing this error. Maybe I fixed it earlier? On FBD, if the mouse is over an arrow, the FBD doesn’t get a release event. Superimposed nature of the forces is confusing. We could also draw these with dotted lines (different phase), so one is not always dominated. Nobody types values for Force1d. Big forces run out of the FBD window. Or we could just factor out scale altogether (a normalized FBD). Wiggle Me: Click to set force in FBD, confusing. I remember even PhET team members were surprised that you can click in the FBD. I fixed a bug that made clicking on the wiggle me ineffective. I don’t think this solved the underlying problem. Windowed FBD seems to be a nuisance. Let’s let this go until we student feedback says otherwise. Reset doesn’t stop the clock. Fridge never moves at default friction. Changing objects with friction off should leave friction off. I can record change of object, if we want. Small distance scale is frustrating. Default: should be barriers on. Should we do something else here? 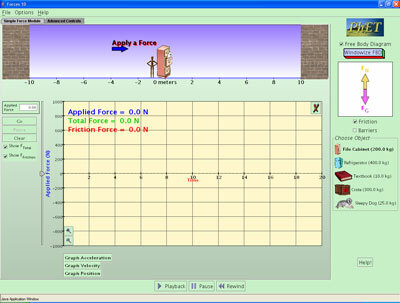 FBD should have subscripts, not N and mg.
Checkboxes for Total and Frictional Force suggest activation of force (not display). Reset advanced controls: restore defaults button on advanced panel. I can put in other planet values. Added tick marks and labels for Moon, Earth, Jupiter. Removed other tickmarks and labels. Nobody clicks help, but students looked for a help menu. I can add a help menu, should we do this for other simulations? Add a noise (or *bam*) when something hits the barrier. Crash sound depends on momentum.